Delaware Hayes’ Paul Burris shoots (21) over Buckeye Valley’s Troy Scowden during the first half of Friday’s season opener at BV. Junior Paul Burris stroked a three-pointer from the left corner in the first quarter to give the Delaware Hayes boys basketball team an early lead. A couple of teammates came up to congratulate him after the shot and it sparked something. Burris buried three more in the frame, including a pair to highlight a 10-0 run – the latter of which gave the Delaware Hayes boys basketball team the lead for good. 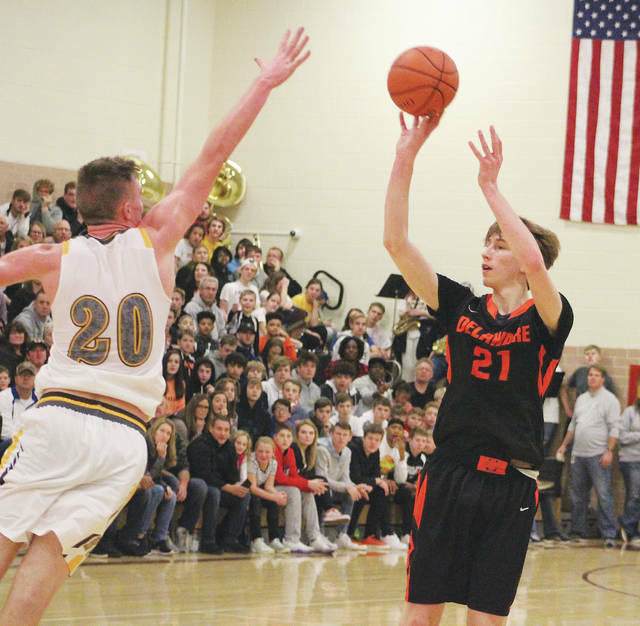 Burris scored 25 of his team-high 30 points in the first half with 18 of them coming from behind the arc and the Pacers rolled to an 80-61 win in front of a sold-out crowd Friday at rival Buckeye Valley. Terin Kinsway scored nine of his 19 points in the fourth quarter, Nate Griggs added 14 points and Jwan Lyles chipped in nine to lead the Pacers (1-0), who are 6-0 against BV since the rivalry resumed in the 2013-14 season. Hayes seemed to struggle at times to find points last year. That doesn’t appear to be a problem after putting up 49 points in the first half alone. Dylan Herbert scored a game-high 35 points for the Barons (0-1) and knocked down seven three-pointers along the way. BV had three players that had never played a minute of varsity see extended minutes. Freshman Troy Scowden scored seven of his nine points in the first quarter. He also pulled down five rebounds had blocked three shots. Burris recalled his first game against BV as a freshman. Next up, BV continues its non-league slate against London at home Tuesday night. Hayes is off until Friday night when it opens OCC-Cardinal play at Hilliard Darby. Both are scheduled to begin at 7:30 p.m.